A day after the bus explosion in Anuradhapura district in the North Central Province in which 16 civilians were killed and 23 others injured, Sri Lanka Prime Minister Ratnasiri Wickramanayake told Parliament that the country is at a critical juncture now that “terrorism is on its last legs and, therefore, the LTTE is showing increasing signs of desperation”. Introducing a motion to extend the Emergency, Mr. Wickramanayake urged everyone to join hands with the government “at this important moment to wipe out terrorism” from the island. 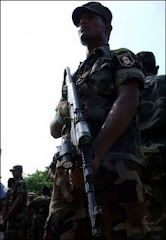 The island nation has been in a state of Emergency since the assassination of the then Foreign Minister Lakshman Kadirgamar in August 2005 and under the Constitution of Sri Lanka, it comes up for review every month. At the end of the debate, Parliament voted to extend the Emergency by a majority of 126 in a House of 225 members. Fifteen members voted against the motion. The LTTE has made 11 attempts on the life of Douglas Devananda. This alone demonstrates the blood-thirsty intent of Prabakaran. Mr. Wickramanayake said that it is the responsibility of every one to create an environment where every citizen can live without fear. Separately, the military claimed that at least 17 cadres of the LTTE were killed in battles.